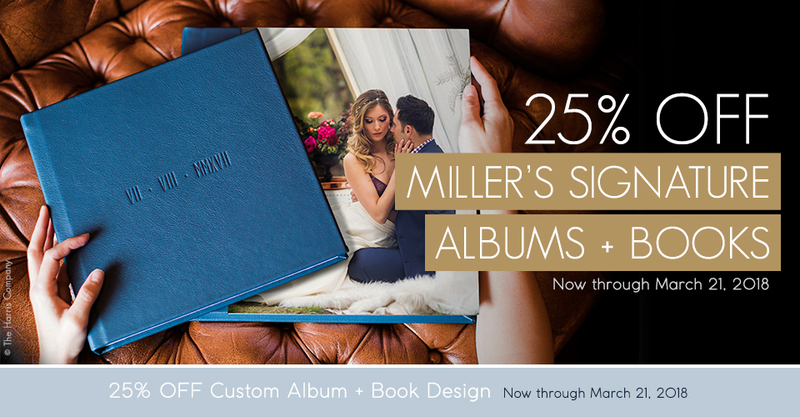 Enjoy 25% off Miller’s Signature Albums and Books through March 21st. Featuring layflat spreads and a variety of premium cover options, get your hands on the most talked about keepsakes in our collection. You can also get 25% off Custom Album Designs from our team in the Art Department. We’re excited to announce that both Miller’s Signature Albums and Books are now available with a 5 spread minimum. Please Note: This sale is valid for Miller’s Signature Albums, Miller’s Signature Books and Custom Album Designs only. Add-ons (Foil Stamping, Gilding) and surface modifications (lustre coating, texture) will not be discounted. Companion Albums and sample albums/books do not receive additional discounts (Companion Albums and sample albums/books are already discounted by 25%). This offer is available through web ordering, ROES and Designer Plus but is not available on orders submitted through Fundy Direct. The sale price will not be reflected in order summaries or email confirmations. The discount will appear once the order has been received by the lab. The cost of Custom Album and/or Book Design does not include the cost of the physical albums or books. Offer expires at 11:59 p.m. (Central) on March 21st, 2018. *Exclusions apply for free overnight shipping, please visit here for additional details. Does this include an additional 25% off companion albums as well? Or just the original album and the companion albums would remain their normal discounted price?